Last year, the publisher I work for merged with another publisher, and then this week I found out that the company I work for at my "real" job is going to be merging with one of their competitors. I suppose this is just the nature of the economic world we live in, but I have to wonder if all of these mergers will cut down on competition throughout the business world. As this medication continues to make me less and less of who I am, I think I've come to the conclusion that it's time to stop taking it. Unfortunately, this medication is one that you can't just stop taking...there are some serious repercussions if you do...like seizures and suicide. My initial impulse was to call the surgeon that prescribed these things to me, but considering it took him many many months to even call me back after my appointment with him, I think it will be better to call my GP when I get a chance, and have him tell me how to do it. I know I'll hear back from him, and I actually trust him...I'm not so sure about this surgeon. It's hard to believe that today is our middle daughter's 8th birthday. It seems like only yesterday that I was pushing her around in a stroller when we were picking her big sister up from school. Time goes by so fast. There was a time when she needed us for almost everything, and now she can pretty much take care of herself...although she still likes to play the helpless child at times. So, happy birthday, Jul. Hope you have a great day, and I hope you love your presents...I think you'll be very surprised. You can now pre-order your copy of A Kepler's Dozen by going to http://www.hadrosaur.com/kepler.html. This anthology features one of my stories, and it will be released in June. 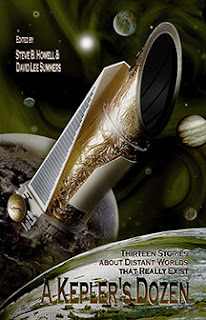 A new anthology of action-packed, mysterious, and humorous stories all based on real planets discovered by the NASA Kepler mission. Edited by and contributing stories are David Lee Summers—best selling author of Owl Dance, The Pirates of Sufiro, and other novels—and Steve B. Howell, project scientist for the Kepler mission. Whether on a prison colony, in a fast escape from the authorities, or encircling a binary star, thirteen exoplanet stories written by authors such as Mike Brotherton, Laura Givens, and J Alan Erwine will amuse, frighten, and intrigue you while you share fantasy adventures among Kepler's real-life planets. The fifth issue of Cosmic Crimes Stories has been released. This is the first issue that I've edited, although in truth, a few of the stories were selected by former editor Tyree Campbell. I've always liked crime stories related to science fiction, so I loved taking over the editorial duties on this zine. Future Imperfect… Crime will always be with us, and as laws evolve, so will the techniques of violating them. In this issue, you’ll meet femme fatales, con men, evil politicians, and a war hero who has trouble adjusting to peace in space. Plus there’s another fine Robichaud article . 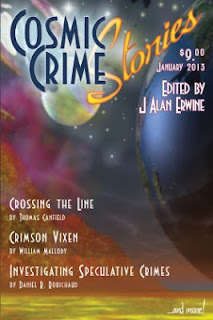 . . and much more in this latest issue of Cosmic Crime Stories! You can order your copy at http://sdpbookstore.com/cosmiccrimestories.htm.